Our skilled technicians strategically plot pattern pieces to yield maximum fabric usage and minimal fabric waste. Efficient Lectra spreading machines allow for tension-free lays and perfect fabric alignment, resulting in substantial savings in both material and time. 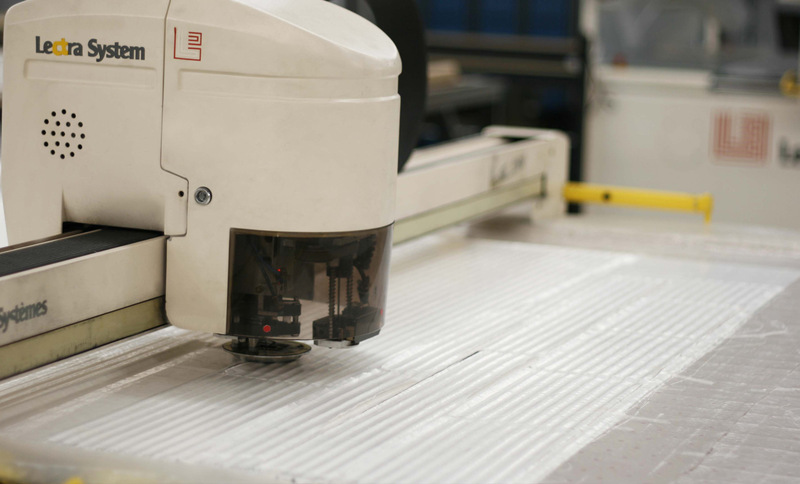 Lectra's intelligent cutting machines act with precision and reliability when cutting patterns. Special 'vacuum technology' allows for layers upon layers of fabric to be accurately cut at once. The cutting machine can accommodate fabrics ranging from fine and intricate to heavy and strong weaves. Clients often come to Eleventh Floor Apparel with paper patterns or those done on Gerber technology. Eleventh Floor Apparel has the capability to quickly convert all forms of patterns to be Lectra compatible and ready to be manufactured at Eleventh Floor Apparel's facility.